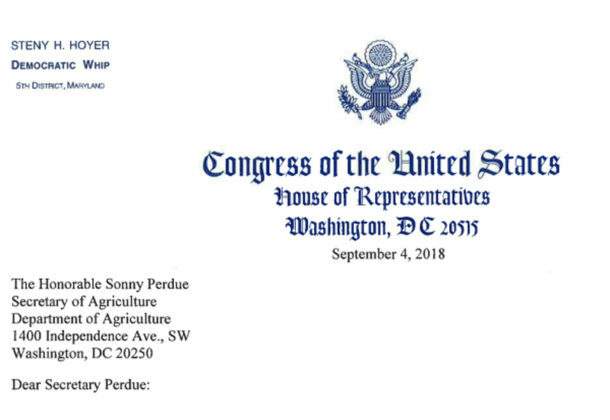 Congressman Steny H. Hoyer (Md.-5th) has sent a letter to Secretary of Agriculture Sonny Perdue to express his opposition to the Department of Agriculture’s announcement that it plans to relocate the Economic Research Service and the National Institute of Food and Agriculture out of the Washington, DC, area. Close to 700 federal employees would be affected by the relocation. Congressman Hoyer said in the letter that he is not aware of any evidence of an assertion that has been made, stating that it’s difficult to recruit talented employees for the agencies because potential candidates do no want to live and work in Washington, DC. “That groundless assertion is belied by the talented work force currently at the two agencies, as well as the large numbers of applicants for vacancies,” he said. The entire letter can be found online.